Shishito peppers are like the new edamame: They're healthy, fun to eat, and completely addictive. This easy recipe is perfect for snacking, served as a side dish, or added to the cocktail menu during your next casual soiree. Shishitos are mild, almost sweet, in flavor but every once in a while you'll come across a spicy pepper that's like a slap in the face—but in a good way. Shishitos are especially good when they're tossed in a screaming hot pan so the skin gets charred and blistered. Just pop one in your mouth, pinch off the stem, and eat it whole—seeds and all. 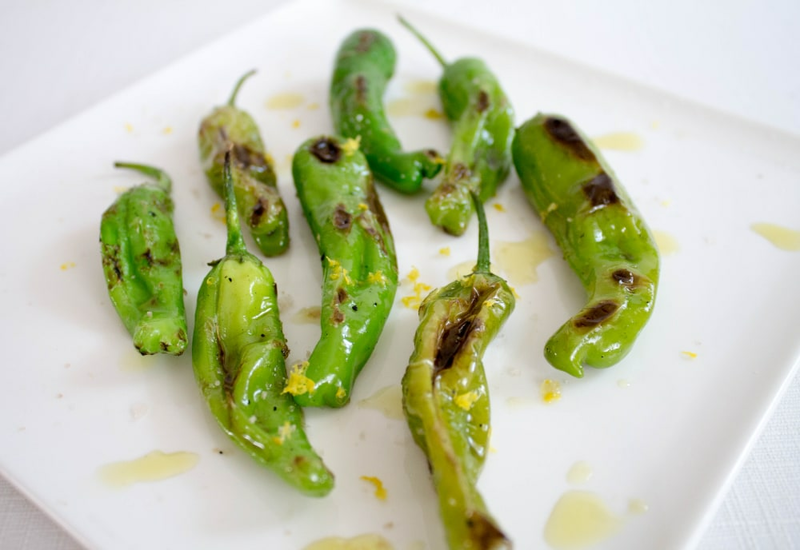 Shishito peppers are all the rage at the moment and you’ll easily find them in fine dining restaurant menus. You can find them at Asian markets, farmers markets, and some fancy stores. Choose peppers that are bright green, firm, and free of blemishes. Per Serving: 160 calories; 14g fat; 9.8g carbohydrates; 1g protein; 0mg cholesterol; 151mg sodium. These were surprisingly good as snacks. I had a version of shishito peppers that was served with a romesco dipping sauce. Will have to make that sauce someday to recreate the dish. Thumbs up! We made these peppers to go with a margarita cocktail and it was perfect! Next time I'll probably try it with an entree. Excellent flavors, hate I've been missing out all this time.